Setting the timing on a Traction Engine | Citroen Classic Owners Club of Australia Inc. Anybody who has attempted to do the timing on the Perfo engine would know how to get the flywheel set to 8 deg. BTDC. The old drop the pin in the hole trick. It is even tricker to remember to take it out. You haven’t been inducted to Traction maintenance till you‘ve been there, that starter motor is merciless! So you have 8deg but the book recommends 12deg, it also has this fancy gizmo you put on the distributor to get you there. This was obviously devised before the strobe light was designed (probably invented by Edgerton and Germeshausen in 1931) to be used for auto tuning. There had to be another way. I didn’t like the idea of markings on the camshaft pulley because of the amount of backlash although that may not be as big a problem as imagined. What I did notice was that you can see the back of the flywheel when looking underneath between the edge of the sump and the bell housing cover plate. I figured if I could put some timing marks there on the flywheel that might do the trick. After some highly advanced mathematical calculation it was determined that 2 deg of arc translated to 2.2mm on the circumference of the flywheel. 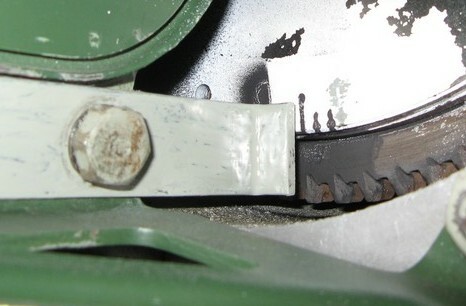 Some white paint was sprayed on the exposed portion of the flywheel (while set at 8 deg. BTDC) and allowed to dry. A small piece of thin aluminium had three slots cut using a thin cutting disk on a Dremell to make a stencil. The one referencing 8 deg. being twice as long as the 10 and 12 deg. slots. This was then stuck on to the flywheel with some masking tape then very quickly sprayed with black then quickly removed to try and reduce the effect of the paint bleeding under the stencil. It worked sort of. 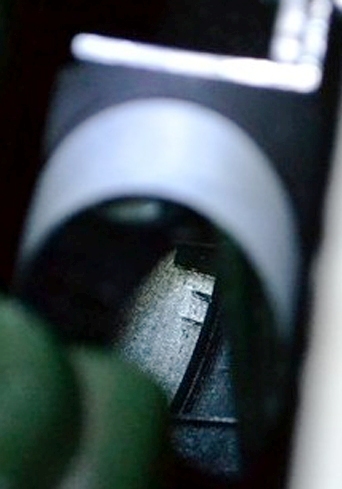 A pointer was made from a piece 3x25mm flatbar bent at right angles and attached as close as possible to the flywheel by using the bolt positions of the engine block to bell housing brackets, see photo. Later I had to remove the engine to rectify an excessive oil leak on the main seal so I took the opportunity to make the marks more permanent with a sharp Cole chisel. With a new timing light that looked like something out of starwars the setup was tested and worked very nicely but was a two man job. One person under with the timing light the other adjusting the distributor. What was needed was a mirror held at 45deg to reflect an image back up beside the engine block. After a bit of scrounging around for bits a tool was fashioned from a piece of flatbar and a spare diagonal mirror from a small telescope. See photo. A bit of polished stainless steel would have done but that was all I could find so it was put to use. The mirror bracket sits on the torsion bar and is hand held in place with a thin flexible steel extension. The last photo shows the reflected image of the timing mark quite clearly allowing a one man operation to set the distributor timing. This entry was posted in Traction. Bookmark the permalink.